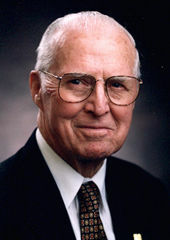 A principal architect of the Green Revolution, which increased crop yields throughout the developing world and averted famine in India and Pakistan, Norman Borlaug won the Nobel Peace Prize in 1970. I bred a better wheat! And grow it row by row! I have to go now! The Third World's farmland calls!